why not? Even adults can find humor (along with exasperation) in the way their kids sometimes act like Archie and sometimes like Katie Ka-Boom. 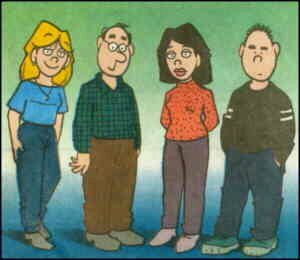 Cartoonist Greg Evans threw his hat into the teen humor ring on March 17, 1985, when he launched Luann. Luann DeGroot (note, two capital letters in the last name but only one in the first) apparently began as a 13-year-old. But she didn't look that old, because Evans started out using a style similar to that of Charles Schulz in Peanuts, where the younger characters had out-sized heads, making them look even younger than they actually were. But she aged, and is now, a couple of decades later, about 16. The first indication that she was going through normal stages of development came in 1991, when she had her first period — making her, by the way, the very first American comic strip character to deal with that potentially frightening episode in a young woman's life. Other possibly touchy subjects the Luann strip has dealt with include drug use (when Luann's friend Bernice Halper got involved with a student who, she later found, smoked pot), drunk driving (when Luann's heartthrob Aaron Hill was injured in a car accident caused by his drinking cousin), and cancer (when Luann's friend Delta James was diagnosed with Hodgkin's Lymphoma). Then there are the ordinary hassles of teenage life, such as dealing with her arch-rival Tiffany Farrell, dealing with her brother Brad, dealing with her mom (Nancy) and her dad (Frank), and dealing with the various teachers, school counselors, etc. that occupy such a large part of her day. About the only one she doesn't have to "deal with" is the family dog, Puddles, unless of course you count having to clean up his namesake, which he leaves all over the house. And while it's neither a "touchy subject" nor something that has to be "dealt with", one little-noticed fact about her is worth mentioning. Luann (and nobody else in the strip) is a member of what is possibly the world's least-celebrated minority. She's consistently portrayed as being left-handed. The Luann series hasn't had major spin-offs into other media, but it's been adapted into stage plays, designed to be performed in school and other amateur productions, twice. Luann is a musical about the timeless process of growing up, and The Trouble with Derek, which adapts the story about Bernice's drug-using boyfriend, is a non-musical which covers the more contemporary aspects of the process. (The same company that adapted these, Pioneer Drama Service, also has a play about Tumbleweeds.) And like most popular strips, several books of strip reprints are out. It was optioned in 2003 as a TV sitcom, but no word as yet on actual production. The strip was originally distributed by News America Syndicate (aka North America Syndicate), which also handled John Darling, Sally Forth and various others. That company was later absorbed into King Features Syndicate. Luann is currently distributed by United Media, the result of mergers involving United Feature Syndicate (Li'l Abner, Gordo), Universal Press (Ziggy, For Better or for Worse), Newspaper Enterprise Association (Short Ribs, Captain Easy) and a few smaller players. Text ©2003-09 Donald D. Markstein. Art © United Media.